↑ Bombay (India : State) (1896). Gazetteer of the Bombay Presidency ... Printed at the Government Central Press. Retrieved 18 January 2012. ↑ "Indian States : Punjab :: Flora And Fauna". India Travel Information. Retrieved 2010-07-18. ↑ 5.0 5.1 "Climate And Resources In Punjab". Sadapunjab.com. Retrieved 2010-07-18. ↑ "ਖੇਤੀ ਵੰਨ-ਸੁਵੰਨਤਾ ਲਈ ਬਣੇ ਠੋਸ ਨੀਤੀ". Tribune Punjabi (in ਅੰਗਰੇਜ਼ੀ). 2018-07-30. Retrieved 2018-08-01. ↑ "Panjab Tourism, General Information". Retrieved 2010-11-09. ↑ Jerath, Neelima, Puja & Jatinder Chadha (Editors), 2006. 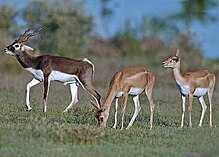 Biodiversity in the Shivalik Ecosystem of Punjab. Punjab State Council for Science and Technology, Bishen Singh Mahendra Pal Singh, Dehradun. ↑ "Punjab Population Data at a Glance-2011" (PDF). Census India. April 15, 2011. Retrieved June 24, 2011. ↑ Census of India, 2001: population of Punjab by religion. Censusindia.gov.in. Retrieved on 2012-01-18. 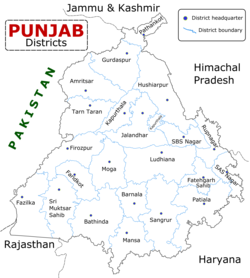 ↑ Punjabi Language, official Language of Punjab, Regional Languages of Punjab. Indiasite.com. Retrieved on 2012-01-18. ↑ Punjabi in North America. Apnaorg.com. Retrieved on 2012-01-18. ↑ Punjabi edges out Tamil in Haryana – India – DNA. Dnaindia.com (2010-03-07). Retrieved on 2012-01-18. ↑ "Punjabi is 4th most spoken language in Canada – Times Of India". The Times Of India. ↑ 16.0 16.1 Punjabi Language, Gurmukhi , Punjabi Literature, History Of Punjabi Language, State Language Of Punjab. Languages.iloveindia.com. Retrieved on 2012-01-18. ↑ ਨਿਰਮਲ ਸੰਧੂ (2018-07-20). "ਸਨਅਤੀਕਰਨ ਦੇ ਰਾਹ ਕਿਉਂ ਨਾ ਪੈ ਸਕਿਆ ਪੰਜਾਬ?". ਪੰਜਾਬੀ ਟ੍ਰਿਬਿਊਨ. Retrieved 2018-08-10.